A latest advertisement with name as APSRTC recruitment has been disclosed to inform the motivated and dynamic persons for the 06 vacancies of medical officers by Andhra Pradesh State Road Transport Corporation. Eligible Job Finder can apply for APSRTC vacancy by depositing the application through offline mode before the last date of December 7, 2018. The competitor is advised to submit relevant documents with the APSRTC application form before the last date of December 7, 2018. Motivated and dynamic, individuals can read detailed ads about APRTC recruitment 2018, which can be well presented through this page www.telanganaa.in. Eligibility Details: Job searchers should have MBBS degree / postgraduate degree / PG diploma or equivalent examinations from any recognized institution. In order to be related to the candidates applying for the above mentioned position and all the categories, the application fee of rupees must be paid. 400 / -. The maximum age limit for candidates applying for 01-07-2018 is 40 years. 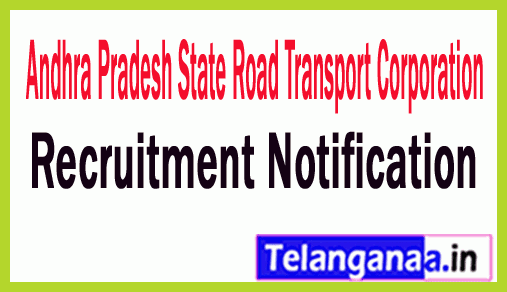 Payments for Andhra Pradesh State Road Transport Corporation jobs: They will get consolidated wages of the applicants to be appointed against this recruitment. 53,495 / - from the recruitment organization. Selection of interested candidates will be based on their performance in the interview, which will be organized by the recruitment panel. Job seekers who wish to apply for APSRTC jobs have to go to the official site, which is http://www.apsrtc.ap.gov.in. A list of this latest opening link will open and the candidates will have to select the most appropriate link, which will open the entire ad with more information about APRTC vacancies. Once filling the application successfully, the persons should send the application form, documents and certificates in an envelope, which is the name of the application ................ at the address given below. ..... .. "are written on top. The last date for receiving the hard copy of the application form is: 07-12-2018. Click APSRTC Recruitment Notification here.